On Sunday, January 3, the 1997 "Jungle Emperor Leo" movie will be aired in Japan at 9:30 PM on Kids Station (Sky PerfecTV! channels 276 and 330). (this info has been added to the Recent history page as well). Nuno Aguiar has sent me another fanart - "Energetic Affection" is another cross-over between Jungle Emperor and Advance Wars video game and again features Leo/Kimba and Jake. You can find this fanart on the Fanart page. Several infos about the past (1995 and 2003) TV airings of the 1993 Kimba episodes in Hungary, as well as the release of the 2006 DVD with these episodes have been added to the History and to the DVD releases pages. Update on the collaboration with the New Japan Pro-Wrestling company - on November 7 yet more rubber keychain figures of Kimba dressed up as wrestlers have been released and are sold at the NJPW Shop, this time of Kota Ibushi and of Ryusuke Taguchi, and another Kimba wearing the black Bullet Club shirt. Another update on the Uniqlo UT shirts - currently the shirts are available only in the recently opened Australian webshop, as well as in Uniqlo stores in Philippines. The shirts are unfortunately out of stock in all other countries (in the Japan, UK & Europe, U.S. and Singapore webshops, and in Uniqlo stores in China, Taiwan, Korea, Germany, France, Russia, Hong Kong, Indonesia, Thailand and Malaysia). And the eBay stores Tokyo Lover since 2012 and Cartoon-Mall also have only few of these T-shirts left. Update on the Uniqlo UT shirts - currently only a few items are available in the Japan, UK & Europe and Singapore webshops, as well as in Uniqlo stores in France, Russia, Hong Kong, Indonesia, Thailand, Malaysia and Australia. The shirts are unfortunately out of stock in the U.S. webshop and in Uniqlo stores in China, Taiwan, Korea, Germany and Philippines. The eBay stores Japan Project, Tokyo Lover since 2012 and Cartoon-Mall also have only few of these T-shirts left. Since June 15 the 1966 "Jungle Emperor" series are again aired in Japan on Tochigi TV, 1 episode a day, Monday to Friday at 7:30 AM. The airing should end on July 20. (this info has been added to the Recent history page as well). Update on the Uniqlo UT shirts - since recently the shirts are available in the U.S. and Europe in their U.S. and UK webshops! The T-shirts are also available in the webshops for Japan, China, Taiwan, Korea and Singapore, and in worldwide shops (including in France, Germany, Russia, Hong Kong, Indonesia, Philippines, Thailand and Australia). Cartoon Network Japan will re-air the original 1965 "Jungle Emperor" series from June 30. 2 episodes a day will be aired from Monday to Thursday at 2:00 AM, and the airing should end on August 12 (this info has been added to the Recent history page as well). Two new artworks have been added to the Fanart page - one is "Lion of a Tankerman" (shown left) and is again made by Nuno, and features Kimba and Jake from the Advance Wars: Dual Strike video game. According to Nuno, "Lion of a Tankerman" regards to the mission when Jake first found and rescued Kimba/Leo. As you can see, Kimba was injured and, even at that first moment, Jake felt a deep love for his new friend (you can see how much love from their eyes)". The other one is called "Hefin Training" by Kirara CecilVenes (shown right) and features Panja, Kimba and Lune, and Lady Hefin from the Runescape 3 game as an interesting cross-over. Here's Nuno' description: "Under the leadership of their protective, caring goddess, Seren, the Runescape elves will finally be appearing! In the elven crystalline city of Prifddinas, the elf you see doing that "crane" pose, Lady Hefin, leader of the elven Hefin Clan is helping Jake train his agility. Of course, Hefin elven agility training is tougher than Orange Star drill exercises and he's having some trouble balancing on that serenity post. Lady Hefin, of course, she's a bit embarrassed with his performance. As for Panja, Kimba and Rune, well, unlike Jake, they are having a lot of fun in the Hefin Agility Course (Kimba's eyes didn't turn out so great)." New (upcoming) DVD release has been added to the Japanese releases page - a re-release of the 1989 series (the first DVD was released in 2002), to commemorate 55 years of Osamu Tezuka's animation debut, and almost 25 years after its first TV airing. It comes in 2 DVD-box sets with total 13 DVDs (7+6). The release dates of the box-sets are November 3 and December 2. As it is usual with japanese DVD releases, these releases have only Japanese audio track, without English subtitles, they are in U.S. NTSC format, and are region-2 encoded. Nuno Aguiar has sent me another fanart - "Friendly Nap" is another cross-over between Jungle Emperor and Advance Wars video game and features Leo/Kimba and Jake, this time Nuno has been experimenting with landscape details, and has added a special detail - a blue butterfly. You can find this fanart on the Fanart page. 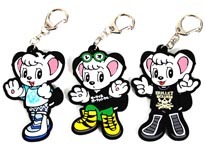 Update on the collaboration with the New Japan Pro-Wrestling company - in May the below pictured rubber keychain figures of Kimba dressed up as wrestlers Hiroshi Tanahashi, Togi Makabe, Shinsuke Nakamura and Kazuchika Okada will be available for sale. Leo Ieiri, the 20-year-old Japanese singer-songwriter whose stage name was inspired by "Jungle Emperor", has made another collaboration with Tezuka Productions in honor of the 50th anniversary of the first airing of the 1965 "Jungle Emperor" series, and for the ongoing "4th one-man Tour" based on her latest album simply titled "20" two collaboration badges (pictured left) and a collaboration can will be sold at every concert venue. The tour will last from May 4 to July 21. To commemorate the 50th anniversary of Kimba the White Lion on TV Uniqlo has released 12 T-shirts as a part of the special "Message from Tezuka" collection for the "Ultra T" (UT) product line. The T-shirts display Kimba as well as other Tezuka characters, including Astro Boy and Black Jack. Currently the shirts can be purchased only on japanese, taiwanese and korean webshops, but since Uniqlo has shops worldwide (including in US, UK, France, Germany, and Australia) look for these great shirts in your nearest Uniqlo shop! And, if you aren't lucky to find these shirts in Uniqlo store in your vicinity, or you don't have an Uniqlo store nearby, you can find the T-shirts in this eBay store; simply search for "Message from Tezuka" (or just "Tezuka"). As part of the 50th anniversary of the first airing of the 1965 "Jungle Emperor" series another "lionish" collaboration project has been made with the New Japan Pro-Wrestling company (whose logo also contains a lion), and the the project will start on April 17 with the release of the green Raglan T-Shirt (pictured right) which is already available for pre-order in the NJPW Shop. Several other collaboration items are planned, and the next one will follow in May, while another one will be presented in early summer (these infos have been added to the Recent history page as well). Also, to follow the 50th anniversary of the first airing, the original 1965 "Jungle Emperor" series that were available on Fuji TV On Demand are still available, as the availability period has been extended to November 30, 2015. Another airing of the original 1965 "Jungle Emperor" series is taking place in Japan. This one has also started on April 2, and it is carried out on Tochigi TV, Monday to Friday at 7:30 AM, 1 episode a day (this info has been added to the Recent history page as well). Almost 50 years after its initial airing on Fuji TV the original 1965 "Jungle Emperor" series are again aired in Japan on Cartoon Network (SD & HD), 2 episodes a day, Tuesday to Friday at 3:00 AM. The airing started on April 2, and should end on May 15. The latest fanart that I received from Nuno is his own Kimba plush that he was working on for a long time and has recently completed it, again as his answer to the sad ending of the 1997 Jungle Emperor movie, which I've added to my Fanart page with pleasure! Unlike Kimba in the movie, this Kimba will live forever, and that was Nuno's intention. The 1997 Jungle Emperor movie will be aired on TV in Japan on 2 stations: on January 1 at 4:00 PM on Sun TV, and on January 2 at 10:00 AM on Gunma TV (this info has been added to the Recent history page as well). A new picture book based on based on the illustrations that Osamu Tezuka drew from the first episode “Go, White Lion" for the LP "Jungle Emperor - Symphonic Poem" will be released in Japan by Juritsusha on November 30. The music from that LP was later made into a movie in 1991 and it was released on DVD twice (this has been added to the Japanese releases and the Recent history pages). The 2006 DVD box from Spain with the 1993 Kimba episodes dubbed in spanish (shown left) has also been released in Portugal in June 2006 by Filmes Unimundo under the title "Kimba o Leão Branco". 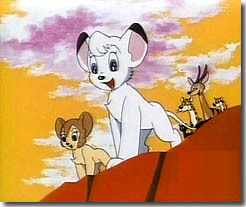 The 1993 Kimba episodes were twice on TV in Indonesia. They were aired on ANTV - in 2009 (December 2009-January 2010) at 7:30 AM and in 2010 (November 2010-January 2011) at 3:30 AM. The first one is "Playful Kids" (shown left) and features Lune, Lukio and Colin from the Advance Wars: Dual Strike video game. Colin is the younger brother of Sasha who is already featured on some of the previous fanarts. The other one is called "Feline Love" (shown right) and features Kimba and Jake; this is some sort of "sequel" to the previously posted "All Cuddled Up" and "Loving Times". Nuno Aguiar has sent me five new artworks, and I'm adding them to my Fanart page with pleasure. The first one is called "A Trusting Love" and, along with Kimba and Jake from the Advance Wars, features Silvertail, the old renegade lion from the Kimba TV series. The next two are called "When I Make A Promise" 1 and 2 (nr. 1 is shown left), and the story behind these is that Jake got himself injured while protecting Kimba, while on a mission to rescue Kimba's family. The last two are called "All Cuddled Up" (shown right) and "Loving Times". All these four feature Kimba and Jake. A japanese 2-minute-long YouTube video has been posted after the celebration of the 100th anniversary of the Seibu Railways, and you can view it here (this has been added to the Recent history page). Regarding the original 1965 "Jungle Emperor" series aired in Japan on Cartoon Network, since September 6 2 episodes a day are aired, and the airings are now Saturdays and Sundays at 5:00 AM (with repeats at 12:00 PM). The airing should end on November 2. This has been added to the Recent history page. Two new artworks have been added to the Fanart page - one is "A Omega Land Sunset" by Marta Lebre (shown left) and features Kimba, Kitty, Lune, Lukio, and both characters from the Advance Wars: Dual Strike video game (Jake and Sasha) as a beautiful group cross-over. The other one is called "Calm Embrace" (shown right) and is again made by Nuno, and features Kitty and Sasha; this is some sort of "sequel" to the previously posted "Warm Blue". Since July 12 the original 1965 "Jungle Emperor" series are again aired in Japan on Cartoon Network (SD & HD), 1 episode a day, Saturdays and Sundays at 6:00 AM (with repeats at 11:00 PM). The airing should end on January 4, 2015. This info has been added to the Recent history page. For the upcoming celebration of the 100th anniversary of the Seibu Railways during which the "Jungle Emperor" series will be promoted, a triple cooperation between Jungle Emperor Leo, Japanese singer-songwriter Leo Ieiri and Seibu Lions has been arranged. This event will take place from August 12 to 17 at the Seibu Dome. This will also be the last time the players of Seibu Lions will be wearing the special uniform that features the mascot Leo which was designed by Tezuka Productions and announced in 2013. Several things will take place during this event, and you can read more about it on the Recent history page. Additional stations that might be also airing Kimba can be found on the Tele-Romántica page on RabbitEars.info. The airing should last until September. Tadahiko Hirano, baritone singer of the opening theme of the 1965 Jungle Emperor and professor emeritus at the Tokyo University of the Arts, passed away on June 13 at the age of 76. This info has been added to the Recent history page as well. On Monday, May 5, the 1997 "Jungle Emperor Leo" movie will be again aired in Japan at 10:00 AM on the TOKYO MX channel. This info has been added to the Recent history page as well. The airing appears to have started on April 5. This info has been added to the Recent history page. The 1966 and the 1997 movies will be aired on two public events in Japan and in the US. The 1966 movie will be shown on the 2014 Tokyo Anime Award Festival (March 20 - 23) as a part of a special screening to commemorate the 85th anniversary of Osamu Tezuka's birth, along with the screening of the 1996 "Black Jack" movie and the 1964 "Astro Boy" movie, while the 1997 movie will be shown on the 2014 Anime Boston (March 21 - 23). Both screenings will take place on March 21. More on the Recent history page. A small update has been made regarding the airings of Kimba in Peru. More on the History pages. 100,000th hit to the home page has been logged on March 10, and the approximate visitor's location was Brea, California, US. Thanks to everyone who visited this website in the past 14 years! Nuno Aguiar, the guy who previously sent me the "A Moment of Affection", has sent me another fanart made in the similar vein to the before mentioned one - "Warm Blue" is another cross-over between Jungle Emperor and Advance Wars video game and features Laiya/Kitty and Sasha who also share the similar type of personality. Also, according to Nuno there has been a spark of romance between Sasha and Jake. You can find this fanart on the Fanart page. On the same page I've put the two component drawings which Nuno used to create "A Moment of Affection". Look for the links to them under the final drawing. On December 19 on a press conference Seibu Lions announced that, on the occasion of the 100th anniversary of the Seibu Railway, they will hold "Jungle Emperor Series supported by Tezuka Productions" in 2014, and the uniform featuring Leo (pictured left) that was designed by Tezuka Productions will be worn at "several official games" in 2014. Leo Ieiri, a 19-years-old Japanese singer-songwriter whose stage name was inspired by Jungle Emperor has released her 2nd album titled "a boy" whose title track's music video has been made in collaboration with Tezuka Productions and features the anime version of Ieiri (based on Kimba) as a young lion meeting the characters from Jungle Emperor. The video combines animated and live-action video (the preview of the video can be accessed here), and the album "a boy", released by JVC Music in both regular and limited edition (including bonus DVD with the mentioned music video and some other extras), is out now. I'm proud to announce a brand new entry that I've added to the "neglected" Fanart gallery page - "A Moment of Affection" by Nuno Aguiar. Nuno made this artwork some time ago as his reaction to the sad ending of the 1997 Jungle Emperor Leo movie. At the same time, this fanart is made as a clever cross-over between Kimba and CO Jake (from the Advance Wars: Dual Strike video game) who seem to share the similar type of personality. Feel free to check it out! On March 22, 2013 the manga books with the first portuguese version of the original Jungle Emperor manga have been released in Brazil by NewPop. The books are in the A5 (15 x 21 cm) format and cost R$ 24,90 each. This info has been added to the Manga page as well. On December 11 RightStuf has released the "Tezuka Starter DVD Holiday Bundle" which consists of 3 Mini Sets (Astro Boy Mini Set 1, Kimba the White Lion Mini Set 1 and Princess Knight Part 1) for the price od 1. You can find more about it and order this bundle on their official page. This info has been added to the Recent history page as well. Thanks to informations found on the italian forum Zap Zap TV, I've added some new informations regarding the airing of Kimba on TV and in the movie theaters in Italy from 1975 to 1982 to the History pages. I've also added to the History pages two old spanish DVD releases (from 2006 and 2007) that aren't Kimba-related by its title, but which do contain some episodes from the spanish dub of the 1993 Kimba series. 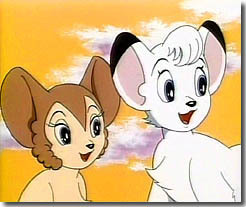 Since December 1 the episodes from the original 1965 "Jungle Emperor" series are available on Fuji TV On Demand, a pay-per-view service of the japanese TV station Fuji TV which originally aired these series in 1965. Only the first episode seems to be available for free, but everything is in Japanese only. The episodes will be available on FOD until November 30, 2014. This info has been added to the Recent history page as well. Again thanks to my dear friend Joachim from Germany, I've added to the History pages his "complete" version of "The Jungle Choir" made from the original TV soundtrack by joining the first part from the beginning of the episode "Die Tierfaenger" (AKA "The Trappers") and the second part from the very end of that episode. It is available in MP3 format, size: 600 kB (and the lyrics are still available). Three new items from Italy have been added to the European Kimba toy & video museum - the reissue of the 45 RPM 7" single from 1979 with the italian opening theme by "I cavalieri del Re", and the two movie posters of the 1966 movie shown in italian movie theatres as "Leo il re della jungla". For all Kimba fans and owners of the Android-based smartphones and tablets, good news are that the japanese on-line bookstore bookpass and KDDI have created a clock widget on the occasion of the good sale of the Osamu Tezuka manga. This clock widget comes with three "versions" - Kimba, Astro Boy and Black Jack. You can download it directly from the Play Store. Thanks to my dear friend Joachim from Germany, lyrics of two songs (The Jungle Choir/Oh, How Beautiful It's In The Jungle and The Jungle Friendship Song) from the 1977 Kimba TV series aired in Germany (with their accurate English translations) have been added to the History pages. A brand new page, the European Kimba toy & video museum, has been created. It is actually a page that was supposed to be made and put on this website some 6-7 years ago, but I never got to that before recently discovering the draft version of the page. Aside from the videos and DVDs that you can already find on this website, on it you can find some rare items, for example some special items that were produced for the first airing of Kimba in Germany in 1977 (like the real wallpaper for your room or the 50 cm high Kimba plush), or the promo poster for the 1983 UK VHS release. There are more items that need to be added, so look for them as well! New DVD set has been added to the Japanese releases page. It is actually the limited edition of the 2005 Osamu Tezuka Animation World DVD set that has been released back in 2008, but I've added it since it is still available from CD Japan. Starting on November 13 the original 1965 "Jungle Emperor" series will be again aired in Japan on Cartoon Network, 1 episode a day, Monday to Friday at 5:00 AM (with repeats at 11:00 PM). The airing will end on January 23, 2014. This information has been added to the Recent history page as well. New japanese release, the Jungle Emperor Best Selection DVD Book Vol.1, a DVD with the best selection from the 1965 Jungle Emperor series and the accompanying A4-sized book, has been added to the Japanese releases page. The official Tezuka Osamu World on-line shop (in japanese) has been added to the Other merchandise page. English version of the original Jungle Emperor manga is finally available as a bilingual comic (Japanese & English) on 191 pages and in pocket book size! However, here is contained only the first half of the entire Jungle Emperor manga drawn by Tezuka, and the rest should follow soon. More info and ordering links are on the Manga page. Lacoste has teamed with Tezuka Productions and the designer Hiroaki Ohya to create the Tezuka Collection for their Lacoste L!ve line of products. For Fall/Winter 2013 (available November 2013 in selected Lacoste stores) scenes from 3 mangas including "Jungle Emperor" (pictured right) were selected for the products. This information has been added to the Recent history page as well. As today is exactly one year since my dear friend Craig Andersen (AKA Kimba W. Lion) passed away of heart attack, although I couldn't do it earlier since I've become a father for the second time (and I now have a son and a daughter, just like Kimba) I've made my "tribute" page for Craig. I will update it if needed, and all suggestions and comments are welcome, especially from those that (just like me) also knew Craig! The 1965 Kimba episodes are on the air in Japan on Cartoon Network HD, 1 episode a day, Monday-Friday at 5:00 AM (with repeats at 2:00 AM). This airing has started on June 20 and will end on august 30. Also, the 1966 Jungle Emperor Leo movie will also be aired in Japan on Sunday, July 21 on MBC 1 at 3:35 PM. Both of these infos has been added to the Recent history page. The 1993 Kimba episodes are currently on air in the U.S., more precisely, in the San Francisco-San Jose on KAXT TeLeRomantica (digital terrestrial TV, subchannel 1.11), Saturdays at 8:00 AM and 8:30 AM, and Sundays at 11:00 AM and 11:30 AM, 2 episodes a day. The airing appears to be started in January 2013, and it will end on August 4. This info has been added to the Recent history page. Just like it was announced, the DVD set titled Kimba The White Lion Complete DVD has been released by RightStuf International on July 9. You can read about it and order it from the DVD releases page. Another new TV airing of the italian Kimba TV series on D1 Television in Sicily, Italy, has been added to the Recent history page. This airing has started on April 27, and 1 episode is aired every Monday and Saturday at 5:35 AM. RightStuf has announced the re-release of 1965 Kimba The White Lion series. The DVD set titled Kimba The White Lion Complete DVD will be released on July 9, however, this one will have just all 52 episodes of the series without any extras. More info can be found on the DVD releases page. Because of constant spamming activity on the previous guestbook, I was forced to close that one and to open a new one, which is now provided by Bravenet, which is also the provider of the "60 Years of Kimba mailing list". You can view and sign it here. A new TV airing of Kimba, this time of the 1966 "Jungle Emperor: Go Ahead, Leo!" series on TV Kanagawa in Japan, has been added to the Recent history page. This airing has started on February 18, and 1 episode is aired every day from Monday to Thursday at 8:00 AM. The airing should end on April 2. A DVD release from 2010, "King Of The Forest", which is actually the 2009 Jungle Emperor Leo TV special (whose name was probably changed because of the copyright reasons) has been added to the DVD releases page. This release is interesting because it contains english subtitles. I've received today an award for "60 Years of Kimba the White Lion" from the Popular Website Awards (PWA), and you can see now the award logo in the top right corner of my home page and near the Awards section of the same page. Additionally, PWA has displayed my website in their Showcase section. Here's what the people from PWA have sent me: "(...) Hi, We are from the PWA and would like to confer on you our Website Award. PWA stands for Popular Website Awards, a widely recognized internet award program and inspirational portal, that identifies the pioneers on the internet. We recognize websites that combine beautiful interactive design with intelligent technology, along with an unmatched dedication to the quality of their service. We have reviewed your website, 50yearsofkimba.com and after reviewing it, we are happy to inform you that your company has been found to pass our quality criteria and we have selected you for receiving the award. (...) The PWA is an internationally represented non profit dedicated to identify and to honor small businesses that continue to excel and grow and deserve praise and recognition for their achievements. (...)"
I've updated the links leading to Kimba W. Lion's website because, after being inaccessible for a while, it's URL has changed (temporary?). An update on screening of the 1997 "Jungle Emperor Leo" movie in Korea has been added to the Recent history page - after the weekend November 16-18 it dropped to place #9, and after the last weekend (November 23-25) the movie reached place #16 and thus dropped out of Top 10 of the Korean Box Office ranking list. November 15, 2012 - Welcome to "60 years of Kimba"! After 3 years of silence we are finally back, even though it is already "62 years of Kimba" that has been marked this month. As you can see, I've done visual reworking of the website, along with reworking of the HTML code behind the pages, and I've managed to catch up with the events that happened in these 3 years. I've also added a new guestbook service since the previous free service by Tripod has been shut down in the meantime, and I've added the "Search this website" function to this website for easy searching. Also, Kimba W. Lion (AKA Craig Andersen), a dear friend of mine and creator of the website of the same name, passed away on October 22, and I've decided to dedicate this website to him, as he helped me many times with this website and gave me suggestions regarding it since its start in 2001. I've added one new page to the Lost pages - "Inside the white lion", which I've forgotten about since it's archival in 1998, but luckily I managed to find it in the meantime. Also, I've added an interesting and fresh info to the Recent history page - according to Korean Box Office, since November 8 the 1997 "Jungle Emperor Leo" movie is shown in movie theatres in Korea, and in the weekend November 9-11 it reached #7 in the Korean Box Office! Way to go! Because of constant spamming activity that was unnecessary consuming my bandwidth, I was forced to remove the fanart gallery as it used to be, and to migrate all the picture to a "static" version of the gallery. Even though files cannot be uploaded automatically like before, everybody is welcome to submit me fanarts by e-mail. Thank you for your understanding! Two new DVD releases have been added to the website: The first one is the french "Le roi Léo" complete DVD box (limited edition), released on March 23, 2009, that at a reduced price contains 20 DVDs with all episodes of french-dubbed 1965 "Jungle Emperor" series and the 1966 "Leo the Lion" episodes, aired in 1990. It has been added to the DVD page, and on the same page several prices have been corrected. The second one is also a limited edition, and it is of the "Jungle Emperor Leo" complete box from Japan, released on July 23, 2008. At a much lower price than the original DVD-box from 2005, along with 1965 "Jungle Emperor" series and the 1966 "Leo" episodes it also contains a bonus - three booklets about the "Jungle Emperor" series. Along with the above addition, another novelty has been added to the Japanese releases page - JpopHelp.com, a Canadian-based website on which you can order major japanese releases. Accordingly, an ordering link to JpopHelp.com has been added to all Jungle Emperor releases from Japan. On History and Recent history pages several updates have been made: After 5 years of airing of 1993 "Canadian" episodes on U.S. TV, some of them have ended in the meantime (on American One and on Kids and Teens Television), and currently there is only one left - Saturdays at 9:00 AM ET on i-Life TV. Also, I've added the past airings of the 1965 "Jungle Emperor" series, of the 1989 Kimba series and of the 1997 movie on TV in Japan. Defunct links were deleted from the Manga releases page, including the ones for the Korean manga. After being released in the U.S. and in France, the 1997 "Jungle Emperor Leo" movie has been released in Germany as well. Just like Right Stuf's english release of the movie, this version also features german dubbing and german subtitles, plus some bonus features like the movie trailer or TV ads. However, this release includes the soundtrack CD of the movie, which makes this release a "Collector's Edition". This information has been added to the DVD page. The first one is good for the Kimba/Jungle Emperor Leo fans in UK, because both Jungle Emperor movies, along with the first episode from the original Kimba the White Lion series and many other works by the great Osamu Tezuka, are going to be shown at the Osamu Tezuka: Movies into Manga festival from September 18 to 24 at the London's Barbican Centre. The second information is interesting only to Kimba/Leo fans in Japan only, as the episodes from the original japanese Jungle Emperor series, along with many other famous works by Mr. Osamu Tezuka, are going to be shown on a new channel that will open on the japanese Internet TV Branco. UPDATE: Branco internet TV has been shut down in January 2009. In Australia the Kimba Ultra Limited DVD box is again sold by JB HI-FI at a reduced price of AU$29.98 (cca. US$26.20) instead of the regular price of AU$140.00. Along with this information, useful mostly to the australian Kimba fans, some other corrections and bad link removals have been made to the DVD page. Many other bad link removals have been made on the Video and on the History pages as well. For those who are interested in watching the re-dubbed "canadian" Kimba series on TV in the U.S., I've updated the airing informations and airing times. Of four TV networks that aired these series, one ceased its operation, and so the 1993 Kimba series can be still seen only on i-Life TV, America One TV and Kids & Teens Television. More information can be found here (scroll down to "2004") and here. For the 6th time in the last 5 years, the 1977 german Kimba series are again aired on german "pay-TV" Junior. This airing has started on July 1, 2008. The episodes are aired Monday to Friday at 8:30 AM, and Saturdays and Sundays at 7:20 AM CET. The airing will end on August 7, 2008. I've also corrected some mistakes on the DVD page, and since in the meantime the last (5th) DVD set with the french-dubbed "Leo" series has been released, I've added that info as well. Yet another small update has been made (to the Recent history page) - from February 2, 2008 the 1991 2nd german Kimba series known as "BouBou - King of the Animals" were again aired in Germany after a long time on Junior, part of the german pay-TV "Premiere". The episodes were aired every day at 11:45 AM. After a big period of time a small update has been made - a new (video) clip, containing the italian version (from the original italian Kimba series from the 1970s) of the song known in the original "Jungle Emperor" series as the "A-I-U-E-O mambo", or "Let's sing a (human) song", has been added to the History pages. It's available as an Windows Media Video clip which you can download here (2 MB big), and I've also written down and translated the lyrics of the song for better understanding. The other new updates will follow in 2008. Until then, I would like to wish you Merry Christmas and a happy and a successful New Year 2008! Two new DVD releases have been added to the DVD page: the first one is a DVD set called Kimba Mini Set that contains 5 DVDs with just first 26 episodes from the Ultra Limited set, and along with that, it doesn't have any extras or booklets. The second release is a "revision" of the previously released (and now discontinued) french "Le Roi Leo" DVD sets that, instead of 3 sets with 6 DVDs, on 4 sets with 4 DVDs offer the complete french-dubbed 1965 "Jungle Emperor" series, plus first half of the french-dubbed 1966 "Leo" series. A new video release has been added to the History pages - it is the rare UK video release from 1983 of Kimba that consisted of two volumes (the first one was released on July 29, 1983). Each of these two volumes had a running time of 90 minutes, and consisted of 4 episodes edited into a movie, which was made simply by removing the opening and closing sequences between the episodes. Thanks to Joachim from Germany, I've made some small corrections of the Production Credits for the 1977 german Kimba series, as well as some updates of the opening theme's Lyrics. Thanks to Peter Domaszwicz, a Kimba fan from Australia, I've added to the DVD releases page an interesting info for australian Kimba fans that didn't yet manage to buy the Ultra Limited Kimba DVD-box set - JB HI-FI is selling on their online shop the Ultra Limited Kimba DVD set for just AU$40.00. I've added two new airing dates of the first 1966 "Jungle Emperor Leo" movie that took place in Italy - the first one (1977) I've found on one italian website (I've mentioned it in References), and the other one (1989) I've added thanks to Francesco Piccardo from Italy. It's interesting that, after being awarded with a "Golden Lion" (1st prize) on the Youth Film Festival in Venice in 1966, this movie was aired couple of times on TV in Italy, while in the U.S. it was never seen. Anyway, both of these informations you can look at a glance on the History by release page (look for "Jungle Emperor Leo - first movie"). Also, on the Video releases and DVD releases pages I've removed some defunct ordering links, I've corrected several other mistakes, and I've put (for those of you who are interested in it) ordering links for the Genius and Digiview DVDs. A cleaner and improved version of the italian opening theme for the 1979 Kimba series has been added as an Windows Media Audio clip (1,5 MB big) to the History pages, thanks to the new source that I found. You can sing along to it with the previously provided lyrics. I've added some new informations regarding the airing of Kimba on Germany's pay-TV "Premiere" on the Recent history page - the first airing on "Junior" will last until August 21, 2007, and along with this airing, 5 of total 38 episodes will be aired on two other pay-TV channels, "Premiere Start" and "Premiere Austria", every Saturday at 6:00 AM. I've made another small update thanks to Marc Bischoff from Germany, this time regarding the airing dates of the 1989 "Kimba" series in Germany in 1999, 2001 and 2002. You can see how it looks like now on the History by country page. Starting today, the original "Jungle Emperor" series (a.k.a. 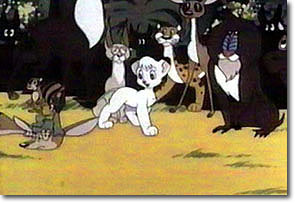 "Kimba the White Lion") are again aired in Japan on Cartoon Network Japan. This info, along with another one about the 1997 movie that was aired on the Japan's "Nitteleplus" channel on 25th June has been added to the Recent history page. Info about upcoming airing of Kimba in Germany in July on "Junior" (part of the pay-TV "Premiere") has been added to the Recent history page. On the Episodes page with the japanese/english/croatian/slovene titles I've corrected the order by sorting it according to the original (japanese) airing order. The U.S. 1993 Kimba airings on have changed a bit in the meantime, and so I've updated them on both History and Recent history pages. Thanks to Marc Bischoff from Germany, I've updated the airing dates of Kimba in Germany in the 1980s. See it in action on the History by country page. On History pages I've also added the titles from the croatian edition of DVDs with 1993 Kimba, as well as one note regarding a typo on the first DVD (the title of first episode is wrong). On the CD releases page I've added the previously unavailable list of CD tracks of the "Symphonic Fantasy" soundtrack of the 1989 Kimba series. Thanks to Joachim from Munich - Germany, I've corrected the number of episodes of the German "Kimba" airings from 1977 and 2004. This was corrected on all History pages as well. The release of the volume 3 of the French "Le Roi Leo" DVD-box sets has been again postponed, and now it should happen on April 27, 2007. A new "Superbox" DVD-box set containing 10 DVDs with all 38 episodes of the original 1977 german Kimba series/dubbing, is going to be released in Germany on March 23, 2007. On the other hand, already several times announced volume 3 of the "Le Roi Leo" DVD-box sets (which should contain the complete french dubbed Leo episodes) has been again postponed, and this time it should take place on the March 27, 2007. Both of these infos have been added to the DVD releases and to the Recent history page. Two airings have finished in the meantime (and have been added to the Recent history page as well): the one with the original 1965 series that was aired for the 2nd time on Cartoon Network Japan, and the UK airing of the 1993 "Canadian" Kimba that took place on Life TV after finishing on INI. I've added a CD reissue of the soundtrack of the 1989 Kimba series to the CD releases page. Just like the original CD from 1990, this soundtrack also contains original music from the series with some extended version. The CD will be released on 21st March 2007. Thanks to Swen Steffens, I've now added to the History pages a clearer explanation of the german "Bou Bou" Kimba series that were aired in Germany in 1991. Along with that, I've added audio clips with the extended versions of the opening and closing theme from the 1989 Kimba series. A tiny update of the Recent history page: the original 1965 episodes are again aired on Cartoon Network Japan, Monday-Friday at 6:30 AM with repeats at 11:30 PM. This airing started on December 11, 2006, and it should last until February 19, 2007. Note: After 1st January 2007 the episodes will be aired at 10:30 AM instead of 6:30 AM. I've finally updated the Kimba videogame story page with some new screenshots from and informations about the unreleased Kimba game for the Nintendo Famicom video game system. Thanks to Swen Steffens, two new German sound clips have been added to the History pages. It is the Dschungel Freundschaftslied ("The jungle friendship song") from the german 1977 Kimba airing, and the opening theme of the german "Bou Bou" series (the 1966 "Leo" series with a different name) aired in 1991. Lyrics of the "Bou Bou" opening theme are also available. On the Recent history page I've updated info about the airing of the original 1965 "Jungle Emperor" series that took place on CNJ from August 7 to October 16, 2006, and I've added info about the new and current UK airing of Kimba. Kimba is now aired on Life TV (and Life Showcase), some sort of a replacement for the previous airing that took place on INI. Several corrections related to the compatibility and appearance of pages in Internet Explorer and Firefox have been made to the History and to the Recent history pages. New french DVD release has been announced. This is going to be the 3rd DVD box released by Declic Images, which will contain 26 french-dubbed episodes of 1966 "Leo" series. It will be released on December 31, 2006. This info has been added to the Recent history and to the DVD releases page. New and better looking pictures showing Kimba's story have been put on the home page. Along with that, the Original vs. 1993 Kimba page has been moved from the DVD releases page, and is now accessible from the entire website. A new DVD has been added to the Recent history and to the DVD releases page - it is yet another french "Le Roi Leo" DVD release consisting of 2 DVD boxes containing all 52 episodes of the french-dubbed 1965 "Jungle Emperor" series, released by Declic Images. Several minor corrections have been made to the History and to the Recent history pages (including the facts that the 1966 movie was awarded with the "Golden Lion" in Venice and that the first french "Le roi Leo" DVD release contains just the french-dubbed 1965 series). On the Recent history page I've removed two airings of the Kimba series that finished in the meantime (in Germany on pay-TV Premiere, and in San Salvador on Agape TV Canal 8). I've also added that the two Jungle Emperor movies were shown in February and May on Cartoon Network Japan, and that an upcoming airing of the original 1965 "Jungle Emperor" series will also take place on CNJ starting 7th August. One new website has been added to the Other merchandise page - it is White Lion Restorations. It has a brilliantly restored version of the very first Kimba episode titled "Little Kimba", along with the complete Leo the Lion series and two more Leo DVDs. All these episodes are uncut, complete, with material never seen before on DVD, and with crystal clear image and sound. 50 new pictures from the episode "Legend of Hippo Valley" were added to the Episode pictures page. Along with that, two new pictures (Kimba and Kitty and Kimba with Kitty and their friends) were added to the top of the home page. New entry was added to the Episode titles page - New Adventures of Kimba the White Lion (1989 Kimba series). 2 new things were added to the History pages - info about previous airing of Kimba in Japan on TV Tokyo in 1992, and a new, updated version of the opening sequence of the 1993 Kimba series. On Recent history page along with some minor corrections an info about an existing airing of Kimba on TV in the U.S. was added. These are the 1993 Kimba series, and they are aired on KTV-Kids and Teens Television. Finally, a new page has been added to this website. In case you still have doubts and questions about which is the right Kimba video or DVD release that you should get (the 1966 or the 1993 one), this summary of all important facts about these two series (including the scans of the corresponding video and DVD releases) should be of great help for you. 2 new DVD releases have been added to the Recent history page: spanish DVD box with some episodes from the 1965 series, and the 2nd french DVD box titled "Leo roi Leo" containing first 26 episodes of the 1965 series. Along with this, informations about current airings of Kimba in Germany and Austria were updated on the same page. Thanks to Francesco Piccardo from Italy that provided me with some informations and corrections, a big update was done on the History pages regarding the airings on Kimba in Italy. On the Episode pictures page the episode "The Wild Wildcat" has been renamed to nr.28 instead of nr.15 because of its place in the correct chronological order of the story. New section has been added to the website - CD releases. New airings of Kimba on TV have been added to the Recent history page - 1977 german dub is aired in Germany on "Junior", Monday to Friday at 9:25 AM, and the 1993 Kimba is aired in the UK on "Inspiration Network International" every Wednesday at 6:00 AM. One important info has been added to that page as well - Gilbert Mack, the voice of Pauley Cracker and Mr. Pompus in the U.S. Kimba series, has passed away on December 5, 2005. New DVD has been added to the Recent history and DVD releases - the french DVD-box set containing all 26 episodes of the "Go ahead, Leo! "/"Onward, Leo!" (in the U.S. known as "Leo the Lion") series dubbed in french and available with french audio only. Several other news have been added to the Recent history page, including info about the airing of the 1997 "Jungle Emperor Leo" that took place on the italian TV channel "Italia 1". One correction regarding the DVD release of the "Léo, le roi de la jungle" movie (1997 "Jungle Emperor Leo" movie translated to french): It will be released on DVD in France on December 7, 2005, according to the official product page. I have corrected this on the Recent history page, and added this DVD to the DVD releases page. New release has been added to the Manga page: two "Jungle Emperor" manga books from Taiwan, printed in chinese and published in 1994 and 2003. New video release has been added to the History pages and to the Video releases page: russian release of the 2 episodes of the 1993 ("Canadian") Kimba. It can be ordered directly from the distributor, but its website is completely in russian. I've corrected several information's on the History pages, including the facts regarding one episode from the 1966 "Leo" series shown in Italy, regarding the airings of 1965 "Jungle Emperor" series on TV in France in 1990, and of the 1966 "Leo" series on TV in France in 1972, and in Germany in 1991. I've also added on Recent history page that the airings of the "Kimba" series currently on TV in Germany and Austria have started on August 24 and August 27, 2005 (thanks to Swen Steffens for that information!). New seller (Movies Unlimited) has been added to the DVD releases page for the 2003 Leo the Lion DVDs and for the upcoming U.S. 2005 Kimba Ultra Edition DVD box set. For the first time Kimba fans in Germany will be able to see German dubbing of their favorite white lion on DVD. Release of the first 16 episodes (on 4 DVDs) has been announced by Koch Media for November 11, 2005. The other 23 episodes (on 6 DVDs) of total 39 episodes aired in Germany will follow later. For more info on this release and ordering please visit the DVD releases page. Correction of the info regarding the upcoming U.S. Kimba DVD box with all 52 episodes of the original Kimba: this collector's DVD box will be released on November 29, 2005, but you can pre-order your copy now (in that case, 25% of the regular price will be taken off). This DVD box for now has the same artwork as the australian Kimba DVD box, but this isn't the final one. For more info please visit the DVD releases page. The complete DVD box containing all japanese episodes from the 1965 "Jungle Emperor" anime and from the 1966 "Go ahead, Leo!" has been released in Japan on September 21, 2005. These series were previously released in separate DVD boxes, but now they are altogether available at a much lower price. 1977 German dub of the original Kimba episodes seems to be on pay-TV in Germany again, and again on "Premiere". The airing ends on October 14 and 15, 2005. This info has been added to the Recent history page. New feature has been added to this website: Fan art section. There are only a few pictures now, but I hope that more will come in the coming days. Also I invite everybody to upload their fan works. According to Kimba W. Lion's website, Right Stuf should release in the U.S. the DVD box set with all 52 episodes of the original Kimba aired in the U.S. in the 1960s and 70s on November 5, 2005. This info has been added to the Recent history page. All 52 episodes of the Kimba series aired in U.S. and Australia in the 60s and 70s will be released on DVD by an australian company, Madman Entertainment, on September 21, 2005. This info has been added to the Recent history and to the DVD releases pages. New info has been added to Recent history page as well: the Kimba/Leo series are continuing in Japan on the Nihon Eiga Senmon channel, this time with the 1966 "Go ahead, Leo!" series. See the Recent history page for more info. Along with some small corrections and updates on the DVD releases and Video releases pages I've added one new detail to the History pages: MIDI file of the opening theme of the 1965 series. You can either visit the History by year page or download it here. I've fixed another detail - now the "Bookmark me!" link (on all pages) should work in both Internet Explorer and Mozilla Firefox web browsers! A new video release has been added to the Video releases page: 1997 french video release of 8 episodes from the 1993 Kimba release. Also, several DVD releases (including the australian and the U.S. release of the Leo the Lion episodes, and the australian release of the 1993 "Canadian" episodes) that I didn't mention before on the History pages have now found their place on these pages as well. Two new info's have been added to the Recent history pages: since June 6, 2005 Kimba is currently aired on Cartoon Network Latin America (in the Boomerang section) from Monday to Friday at 6:00 AM ET,2:00 PM ET and 10:00 PM ET, and since April 20, 2005 the 1997 "Jungle Emperor Leo" movie is out in theaters in France. New comparison has been added to the "Episode titles" page. This time, it is the comparison of the Leo the Lion episodes. A small detail has been added to the Kimba videogame story page - the second video game for the Sony PlayStation 2 based on Osamu Tezuka's works, "Dororo", has been released in the U.S. as well (under the title "Blood Will Tell"). Several information's (including a new info that Kimba is currently aired in El Salvador) have been corrected or added in the year 2004 of the History pages. Two new releases have been added to the Video releases and DVD releases: 1995 french video release of 20 episodes from the 1966 "Go ahead, Leo!" series, and another DVD release of the 1993 Kimba episodes, made by Genius Entertainment. I've added "Le Retour du Roi Leo" to the History pages as well. Thanks to India Williams, I've added one detail to the 1990 french airing of the 1989 Kimba episodes on the History pages: these episodes were also aired under the name "Le Retour du Roi Leo", along with the name "Le Retour de Leo". I have moved the cellphone (WAP) version of this website to a more simpler address. The new WAP address is wap.50yearsofkimba.com. Because the TV schedule has changed in the meantime, I've updated the current U.S. airing times of the 1993 Kimba series on iLife TV and America One Network on the History pages. Update of the Manga page: a new italian release of the original "Jungle Emperor" manga has been released in Italy in the last three months by Hazard Edizioni. It can be purchased on the publisher's website, but it seems to be available only to italian citizens (for now). The Kimba videogame story has been updated with more scans of the ad for the Kimba videogame for the Nintendo Famicom, as well as with some more details and links where did these pictures come from. February 25, 2005 - Welcome to "55 years of Kimba"! The History by year page and other History pages are rearranged, and the time range on them is now from 1950 to 2004 (the Recent history page now starts at the year 2005). On the Video releases and the Japanese releases pages I've added the ordering link for the movie soundtrack of the 1997 "Jungle Emperor Leo" movie, and I've added a new japanese release, a DVD containing the 1966 "Jungle Emperor Leo" movie (view more info here). New section has been added to the website: Manga. From it you can order all releases of the original "Jungle Emperor" comic that I know of around the world. Unfortunately, the english version of the manga is not available yet. A new feature has been implemented in this website: RSS feed/Live Bookmark. With this feature Mozilla Firefox users can see what's new on a website directly from their Firefox browser, without any need to visit the website itself. To subscribe to this website's RSS feed, simply click on the orange rectangular "RSS" icon or the square orange icon in the bottom right corner of your Firefox browser, select "Subscribe to...", choose "Bookmarks Toolbar Folder" option in the "Create in" field, click OK and the "50 years of Kimba" Live Bookmark should be displayed in the Bookmarks toolbar of your Firefox browser. 20000th visit to the home page has been logged today (the visitor's approximate location was Morristown, NJ, USA). Thanks to everyone that visited my website in these 3 years, I'll do my best to make it even better! Again thanks to Lauri Welling from Finland, I've put on the History pages a Windows Media clip with the Finnish opening theme (recorded in 1986) and its lyrics. I apologize for the quality of the sound, I tried to improve it but couldn't do more about it. The theme can be downloaded here and the lyrics (with translation) here. Also, I've updated ordering links on the Video releases, DVD releases and Japanese releases pages, removing nonfunctional as well as adding some new ones. Kimba in Finland: Thanks to Lauri Welling from Finland, I've provided two new information's on Kimba being released and shown in Finland. See my History pages for more information. New feature: I've added here "The Kimba videogame story (so far)", my article containing a brief summary/review of everything that was done so far regarding the Kimba video or computer games. Screenshots are included! Kimba is currently aired in Europe as well. It is aired on "Junior", a channel that belongs to the german pay-TV "Premiere World", Monday to Friday at 10:40 AM. On History and Recent history pages three new airings (in Croatia on "TV Nova Pula" and in Turkey on "Star TV" and on "Cine 5") were added. A new table containing the 1966 Kimba English titles and the corresponding titles from the German, Italian and French version of Kimba has been added to the Episode titles - comparison page. Thanks to Lucie Gignac from Canada, the complete lyrics of the 1972 French "Le roi Leo" opening theme have been added to the History pages. Translation of the lyrics is included with the lyrics, and you can view the lyrics here. A minor info about another airing of the 1993 Kimba episodes in Croatia has been added to the Recent history page. Kimba is currently aired in the U.S. on another TV - Urban America TV (I don't know which episodes are these) and in Japan on Nihon Eiga Senmon Channel (the original 1965 "Jungle Emperor" is aired there). Check my Recent history page for more information. Minor update of the website: Due to the increased popularity of the Mozilla's browsers like Mozilla and Firefox, and because my website isn't displayed properly in them, I've optimized its pages so that they are displayed correctly in both Internet Explorer 6.0 and Firefox 0.9.x. I've added a new audio clip to the History pages: I managed to find the 45rpm record with the opening theme of the French 1990 "Le retour de Leo" series sung by Claude Lombard. It is in the Windows Media 8 format (since it didn't sound correctly after being encoded it to RealAudio). I've also managed to translate the lyrics from French, take a look. The airing of the 1993 Kimba episodes in Spain has ended last month, and that was mentioned on the Recent history page. Kimba is aired on another TV in the U.S. - America One, on Sunday. Unfortunately, these are the 1993 "Canadian" episodes and not the original ones. Check my Recent history page for more information. I've corrected some tiny details on the History pages, and one new website (KimbaKids.com) is added to the Other merchandise page. This website sells the 1993 episodes (in an unusual way) and is planning to have Kimba/animal finger puppets as well soon. Several new information's have been added to the History and Recent history pages - more info's about previous airings in Spain, and the fact that the 1993 Kimba remake has been issued on DVD in Croatia and Slovenia last year (episode titles on the DVD from Slovenia are provided by Tina from AnimeSlovenija.org. These titles are entered/updated in the Episode titles page as well. One new thing has been added to the title page: a poem about Kimba I wrote recently in a brief moment of inspiration. An image from Kimba W. Lion's website has been added to it (with permission) as an illustration. Also, I've added that Kimba is currently aired in Spain on regional TV station "Canal Sur" since the middle of this month. Visit Recent history page for airing information. I found out this morning that on iLife TV are aired the 1993 "Canadian" episodes of Kimba and not those original from the 60s and 70s, and I've updated that information on the website now. April 11, 2004 - Happy Easter! Kimba is back on TV in the U.S.! This time it is aired on the iLife TV (Inspirational Life TV), which is available on cable TV and satellite. See Recent history page for more information! Also, all RealAudio clips on the History pages (except the previews of the ringtones) have been replaced with the streaming RealAudio clips, so that you don't have to wait for the download to end to hear it. Added to the Video releases info about the 1995 reissue of the german videocassettes from 1986 containing the first 5 episodes from the 1977 german airing of Kimba. It is available on Amazon.com Germany (the site is entirely in German). 15000th visitor to the home page has been registered today (approximate location: Columbia, MD, U.S.A.); Thanks everyone for your interest in my website, and thanks everyone who visited my website in these 3 years! New information's about 3 past Kimba airings have been added to the History pages. On the home page two pictures were replaced (now you can see Kimba and Dan'l Baboon along with nice Kimba on the top and another version of Kimba and some of his friends after the Story). Added more information that I've found about the airing of the 1989 Kimba series (also known as "New adventures of Kimba the White Lion") in France in 1990, "Le Retour de Leo", along with the lyrics of the opening theme (without translation from French for now, sorry; on the left is the scan of the 45 rpm record with that opening theme). See the History pages for more info. Added info about the U.S. DVD release of "Leo the Lion", and two (for now) sellers of the DVD, to the DVD releases page. On the same page two "Leo the Lion DVD" ads that I've found on Tripledecker.ca can be found. Added to the home page info about how to get the Spanish Kimba videos (I received this info from a nice lady from Costa Rica called Rosa Agüero). Check it out! The airing of the 1993 "Kimba the White Lion" series on Life TV (Sky Digital, channel 202) has finished last month, on December 16, 2003. This info has been updated on the website. Added ordering links of another site (EzyDVD) selling the australian "Leo the Lion" DVD release, to the DVD releases page. On the same page a new DVD release has been added: the australian DVD release of 8 episodes from the 1993 "Kimba the White Lion" series. Removed some broken links from the History - References and from the Lost Pages page. I finally managed to find the opening theme of the Italian 1999 Kimba release "Una giungla di avventure per Kimba", and I'm happy to share it with you. So far this is the only place on the whole Internet where you can find it. It is in RealAudio format, and you can download it here. The lyrics (with translation) can be found here. I also wish you Merry Merry Christmas and a Happy New Year! New seller/new item added to the Other merchandise page - a brand new Kimba plush made by Banpresto and available through UFOcatcher.com (NOTE: The 2003 Kimba plush shown here has been sold out in the meantime, and currently no Kimba plush is available). Added new DVD release to the Japanese releases - "Best Selection" of the episodes from the 2 DVD-box sets of the 1965 "Jungle Emperor" original series. Click here for more information. With permission of Mr. Mattias Kolle, I experimented with the "Dschungelchor" ("Jungle chorus") MP3 clip from that webpage, and I've managed to turn that audio clip into a video clip so that you can get the picture where is it from and what is it about. It is in RealVideo format and you can access it here. On the home page I've put back and modified a bit the description of the other parts of the website, and I've attached to it my opinion about Kimba W. Lion's recent discovery regarding the Kimba vs. Simba controversy (yes, I know that it was written last month, but I didn't find enough time to put it on my website earlier). Also, I've moved the Classified Ads link from the bottom of the page to the left tab of the Merchandise pages, I've moved the visitors counter to the left tab of the page, and I've moved the guestbook links to the left tab of the home page and other pages of the website. On the History pages I've added a new fact about Kimba being aired in 1997 on Fox Kids satellite channel, and I've added a small note about the clip with the music from the 1991 "Symphonic Poem" movie. I've just discovered that the italian Kimba airing called "Una giungla di avventure per Kimba" (consisting of the "Kimba the White Lion", of the "Leo the Lion" and of the 1989 Kimba episodes) has repeated its broadcast after exactly 4 years in Italy on channel Italia 1. The broadcasting started on 8th September (and it was aired from Monday to Friday at 08:15 AM GMT), but it temporarily ended on September 19, 2003, and it seems that the airing has been interrupted for an indefinite period of time. I've added this info to the Recent history page. Added three new things to the home page: two new pictures at the top of the home page, section with the video (both VHS and DVD) ordering links of the original Kimba from 1966 (with Kimba W. Lion's permission, since this is his idea), and Classified Ads where you can buy, sell and trade Kimba items for free. Latest news about volumes 3 and 4 of the "Kimba the White Lion" DVD release: RightStuf announced that these 2 volumes have been discontinued and have been removed from their catalogs. I've updated that on my DVD releases. One of the "lost pages", "Simba, meet Kimba and Zimba" has become an online page again, and I've corrected that on Lost Pages. More changes were made to the website design, particularly to the History pages. For example, those special semi-round tabs (for each year or release or country) are now replaced with fields with gradient fill, and the top graphic is now "connected" with the blue left column. Also, one new detail is added to the top left graphic throughout the website - a drop-down menu which can be used for easy site navigation and as a small site map. Luckily, the 1993 "Kimba" series continues its airing in UK on Life TV, former Liberty TV. The schedule is the same: Tuesdays at 4:00 PM GMT. Along with this information, five other informations (including the one that the 1997 "Jungle Emperor Leo" movie will be aired July 4-5, 2003 at Anime Expo in Anaheim, California) were added to the History pages and the Recent history (History after 2000) page. I've heard that UK's CTC has changed its schedule (the program now starts only at 8:00 PM CET). I'm not Sky Digital's subscriber, I don't have access to CTC's program guide and therefore I don't know if Kimba is still aired on CTC. If anyone knows if it is still aired, please let me know! Any information will be appreciated! Slight changes have been made to the website's design (notice the new look of the left side column). New feature, 55 years of Kimba mailing list, added. With this mailing list you can easily find out what changes have been made to the website. I'll use this list to send other announcements (for example, about new airings on TV) as well. Updated the italian opening sequence from 1979 clip with a slightly better version. Check it out! Updated name of one of the sellers on the Other merchandise page. Removed some broken hyperlinks on the History - references and Video releases pages. Preview of the Kimba wallpapers is available through the link "Kimba wallpapers" on the bottom of the home page. Added support for color cellphones to the WAP-page, featuring new content - Kimba wallpapers! These wallpapers are intended for NOKIA and other color cellphones that support wallpapers, and are tested on NOKIA 7210. Corrected the ordering link for the DVD-box "Jungle Emperor Leo - Susume, Leo!" on the Japanese releases page. Added info about two upcoming volumes of the 2003 Kimba the White Lion DVD release, volume 3 and volume 4, which will be released on July 15, 2003, to the DVD releases page. Moved website's guestbook from History by year page to the home page. Another new feature, Recent video releases, added to the home page. New feature, Kimba currently on TV, added to the home page to spot easily where the current airing(s) of Kimba are. New info (about showing the 1997 Jungle Emperor Leo movie on the LA Anime Festival) added to the History after 2000 page. Moved the ordering links of the 2 releases from CD Japan to the new section, Japanese releases. Added 4 other releases to that page. Corrected the lyrics of the U.S. 1966 Kimba, and added the 2nd version of the theme with four different ending verses, to the History pages. Added new information about new airing of Kimba in UK (thanks to Rebecca Gunn for that information! ), on CTC (Christian Channel, part of the "Sky Digital"), every Tuesday at 4:00 PM GMT. This is on the History after 2000 page. Added 2 new sellers of Kimba items to the Other merchandise page. Updated the ordering links for the "Symphonic Poem" and the 1997 "Jungle Emperor Leo" movie from CD Japan with scans of the DVDs and prices. Added ordering links on CD Japan's website for the "Symphonic Poem" and the 1997 "Jungle Emperor Leo" movie to the Video releases page. Changed website's structure a bit, comparison of the episode titles is now available on the home page (it was moved from the Merchandise section). Ordering links of the new seller of the "Kimba the white lion" DVD release, Amazon.com, added to the DVD releases page. On that page were also corrected some prices of the "Leo the Lion" DVDs. Updated info about "Janguru Taitei" manga in the "Manga Shonen" magazine (published by Gakudosha). One new fact, about the reissue of the "Janguru Taitei" manga in Japan by Kodansha in 1977, added to the History pages. 1 new RealAudio clip (the 2000 version of the 1979 opening theme) and 1 new RealVideo clip (closing sequence of the 1993 Kimba remake) added to History pages. The release date of the "Kimba the white lion" DVD release is changed to the 25th March 2003 (this was changed on the site as well). Scans of the covers of the first two DVD volumes are added to the DVD releases page. Info about the new showing of Kimba in Croatia added to the History after 2000 page, thanks to Zlikowsky for that information! Added info about another DVD release, the australian DVDs with the first 6 "Leo the Lion" episodes (and with links to places where it can be bought online), to the DVD releases page. Added another new section, the Other merchandise section, with info about and links to some online places where you can buy Kimba stuff (more of them will also be added in the future). Also, across the website "Video releases" is renamed to "Merchandise". Info about the DVD release of 1966 Kimba episodes by Right Stuf added to the new, DVD section of the Video releases page. New picture (Kimba with some of his friends) added to the home page. On 25th February 2003, 26 episodes of the 1966 U.S. "Kimba" TV series will be available on DVD by Right Stuf. This info is added to the History after 2000 page. Slightly changed the structure of the website, the Story page is now its home page. Added 2 new RealVideo clips, the 2 trailers of the "Kimba the white lion" TV series aired in 2001. on ex-"Liberty TV", to the History after 2000 page. Updated picture for the year 1991. with the picture of a rare Italian video release. Accordingly, info about that video release was added to the History pages. Added 2 new RealAudio clips, japanese opening theme of "New adventures of Kimba the white lion" from 1989, and the opening & closing themes of "Leo the lion". Corrected the ringtone of the 1979 Italian opening theme and URLs. Added the first MIDI, MIDI file from the 1979 theme, to the History pages. Corrected the prices and removed links that didn't work on the Video releases page. Added new informations about showings of the 1997. "Jungle Emperor Leo" movie on various film festivals and events, to the History pages. Added new RealVideo clip, the 2nd italian opening sequence from 1979. Updated picture for the year 1979. with 4 new screenshots. Added new RealVideo clip, italian opening sequence from 1979. Improved appearance (colors) of the pictures for the years 1966. and 1977. Slightly updated picture of the "Kimba der weisse Loewe" LPs from Germany on the History by year page. Updated the 1999 lyrics on the History pages (with the help of the hyperlink nr.29 in References). Added new info about airing of "Kimba" TV series in Germany in 20th September 2002. on the History after 2000 page.